When considering what type of gate to install on your property, there are some serious choices that you will have to make. One of the biggest decisions you will make is the type of door - swinging or sliding. These are the most common new gate installations. Here are the advantages and disadvantages of each type to consider when making your final decision. One of the things that will help you in your decision is the space available and where the actual gate would be positioned on the property. If you don’t have at least 10 to 12 feet at the entrance to your driveway, a swinging version might not be possible. Also, you will have to check the slope of the entry way. Steeper grades may mean that a swinging version is not in the cards. You also should consider what is on or near the area around the entrance. If there is landscaping or if the area needs to be used for parking, that may determine which gate you must choose. If you have heavy wrought iron gates or steel gates, you need to understand that they can do some serious damage to you, your family, your pets, and your vehicles. If one of the doors hits you, you can wind up with devastating injuries. You definitely do not want one of these hitting small children or a small pet. Swinging gate safety loop sensors will help prevent doors from crashing down on someone or something. The swinging models do have some dead space though where a person or object will not be picked up by the sensor. 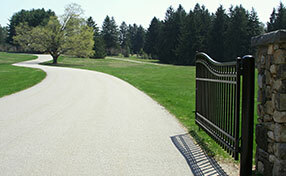 Sliding gate safety sensors can also prevent doors from closing on a person or object. Both models come with some sort of safety system. Find out which you will be more comfortable with. 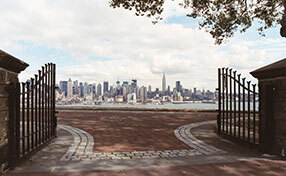 There are some other things to think about too when considering which gate to choose. If there are multiple entry points, you may want to consider a package deal. You will have to consider their material and how heavy they will be. 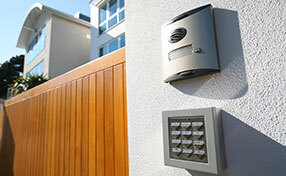 Once you decide between swinging and sliding, your next choice is a gate intercom system.